I’ve been sitting here crocheting all morning and—quite frankly—feeling really blessed to be able to spend my days being creative. It’s wonderful to be in charge of my own schedule, make decisions about what projects I want to pursue, and indulge my creative whims. I feel privileged to live this kind of life. It’s a life that I have chosen and one that’s perfect for me. However, along with all that creative freedom also comes the responsibility of generating income to support myself and my family. Yes, I have kids and bills and a big dog with severe food allergies. These things cost money, but I don’t want money issues to stop me from living the life that is right for me so I’ve learned how to make the most of my time and talent in my home business. This post contains links to affiliate products or services that I use and enjoy. I may receive compensation if people choose to use these products or services based on my recommendations. If you are a creative person wanting to branch out and sell your wares beyond your circle of friends or local craft fairs, then Etsy is a great option for you! Once you have your store up and running, you can start making sales. When you sell an item, you pay a transaction fee of 3.5% and a payment processing fee which is also a very small percentage. To give you an idea, many of my items sell for $3.99 USD. I typically receive about $3.62 after the fees. Figures can vary slightly based on currency conversions and the payment method the buyer chooses. Etsy will also handle extra fees like the VAT tax required in European countries so you don’t have to worry about calculating those. Then once a week Etsy will deposit any sales money you’ve earned into your bank account. Cha-ching! Listing on a site like Etsy exposes your products and creativity to an international audience! Etsy gets millions of visitors every week. You would be hard pressed to get that kind of exposure locally. So here’s another factoid about me. Many years ago, I learned a very valuable lesson in business while I was working at a marketing/advertising firm I’d started with my husband. I was making pretty good money, but to be honest, it was a grind. In order to earn income we had to find a client, get their business, design their website, brochure, or printed materials, then invoice them. Once complete the process started all over again. We had to work through this process (which could take months to go from start to finish) for each paycheck we wanted to receive. I quickly realized we were trading time for money—and we only had so much time. That meant we were incredibly limited in how much we could earn … and we were tied to long hours of hard work. As a crafter, you may be in the same situation. You can only crochet so many hats and scarves in a day. Maybe you have kids and a spouse who rely on you, so you can only work so many hours on your creative projects. That limits the amount of income you can earn from your crafting. Like my marketing business model, you are tied to that one project / one payout business plan. But there’s an amazing solution! You can increase your ability to earn exponentially without investing endless hours when you create a product that you can make once and sell over and over again, like a pattern or a tutorial. As a highly creative person, chances are that you’ve developed some methods, techniques, and patterns along the way. As an entrepreneur, you have the opportunity to share your patterns and techniques with the world in the form of another product. You could write up detailed instructions about your special methods with pictures to demonstrate what you do and sell this instructional as a PDF download. You could put together a video tutorial of one or more videos and create a class so that people can follow along with you as you create your amazing product. You could sell your patterns and parts lists for sewing projects, crochet or knitting, or even woodworking. People will gladly pay a fee to get specific instruction and targeted tutorials from a person who has mastered an art form. You can help them create projects as beautiful and useful as the ones you make and earn income in the process. Don’t be afraid to share this info and profit from the creative trailblazing that you’ve done! If this is an area you are interested in branching into, there are platforms and services that can help you. If you have downloadable patterns and tutorials to sell, Etsy is a great forum for that kind of product. Teachable is a great venue for video classes. I use both services and enthusiastically recommend them! If you’ve spent months or years developing your craft, chances are you’ve done a lot of searching and hunting for the best supplies and parts for the best prices. In some instances, it’s possible to become a distributor. Or perhaps you can buy in bulk for a discount and resell the parts for a small profit. If you create a unique part for you project, perhaps you can sell a portion of your project to help people duplicate your results. For example, maybe you watercolor your own card stock for some really beautiful handmade greeting cards that you make and sell. People write you to ask where you get that amazing card stock. Why not make extra and sell them to other paper crafters? Another way to turn your supply chain into an income stream is to consider whether your projects could be packaged and sold as kits. Put together a pattern or instructional and pair it with all the parts and supplies a person needs to accomplish the project, then sell it all as one kit. Give people everything they need to complete your project so they don’t have to go to a dozen stores rounding up supplies. This saves a customer time and money, and they get everything they need in one easy purchase. One final way that I make money as a creative entrepreneur is to participate in affiliate programs. Over the course of my business journey, I have tested and tried all kinds of products and services. I’m happy to share my experiences and feedback with other creative folk. Many companies that I use and enjoy have affiliate programs. What that means is that if I like their services, I can recommend them to my online community of people. Should someone decide to use the product or service based on my recommendation, I receive some form of compensation. Some programs offer a finder’s fee (as in cold-hard cash!!) while others will reward their affiliates with credits to apply to products or services. Affiliate marketing is an amazing way to bring in extra income once you learn the ropes. I wanted to try affiliate marketing for years, but didn’t really know where to start. Finally, I found some help and answers to my questions in an ebook I downloaded from House of Brazen. The book is called How to Make Your First Affiliate Sale in 24 Hours and does an amazing job of walking a person through the process of getting started. After reading the book and trying out the basics, I knew I wanted a more detailed journey into the art of affiliate marketing. I chose to sign up for a class called Making Sense of Affiliate Marketing taught by Michelle Schroeder-Gardner. Michelle makes over $100,000 a month from the affiliate marketing streams she’s built over the last few years. That’s right! 100K every month! The course, which includes over 50 lessons that you can work through at your own pace, is incredibly thorough and totally sets you up to begin a successful foray into affiliate marketing. She gives you info about dozens of companies you can work with and ideas for how to implement a successful strategy on numerous fronts. I loved the course the first time I went through it, and since I have access to it for life, I continue to go back and review sections to broaden and strengthen my affiliate marketing work. If affiliate marketing is a subject that interests you, you can sign up for Michelle’s Making Sense of Affiliate Marketing course at any time. You will get information to log in immediately after you sign up. Begin the course when you are ready and work at your own pace. And the great part is you have access to the course for as long as it is online, so you can go back and see updates and review sections you want to work on. This is one of the best classes on the market and Michelle has a proven track record. I highly recommend the class! So that is a quick overview of a few ways that you can earn money working from home while doing something you love. If you have been wondering if crafting for cash is an option for you, I hope you’ll give some of these ideas some serious thought. It’s possible to start slow and work on building your creative business your free time, so why not give it a shot? So you want to become an Etsy seller? Or maybe you recently launched into an Etsy store, but you aren’t getting the sales and traffic that you want to generate. Don’t panic! Selling online is a science, and I can help you demystify some of the equations. I’ve had an Etsy shop for years, but for the first two or three years of running my shop, I had very few sales. In fact, I considered closing it down altogether. But then I did some research and implemented some tips, tricks, and techniques that really boosted sales. I started turning a nice profit in my shop, which was the goal all along. Interested in knowing what I did? Here are 15 quick and easy ways to improve your Etsy store to attract traffic and sales and convert at a higher rate. Visit the best-selling sites on Etsy and you will find they all have one thing in common…a terrific banner. A banner is the horizontal image that stretches across the top of your computer screen when you first load a webpage. Etsy gives sellers the option to customize their store by uploading a banner that showcases their products or displays their branding. The banner is literally a person’s introduction to your Etsy store, so choose something inviting that fits with the personality of your products and familiarizes people with what they will find in your store. You could take artsy closeup pictures of your products, or buy stock photography that fits with your store’s theme. If you aren’t good at adjusting images or typography, you can hire someone to help you develop a great look for your store. As a former web and graphic designer, I occasionally hire out my services for small jobs like this. Contact me! Brick and mortar stores have names, and so do Etsy shops. As you set up your creative business, you will want to choose a name that represents who you are and what you sell. When choosing a title, keep keywords in mind. What words might people type onto a search to find your store? Use one or two of your most relevant keywords in your shop title and you have a better chance of attracting business. On sites like Etsy, a personalized buying experience is truly important. People like to know who they’re buying from. Use the Shop Owner field to upload a picture of yourself and take some time to write a background or history about your creative wares. Personalization helps people connect with you and your products in a way they don’t on Amazon or other online retail stores. Have a few products you really want your visitors to see? Choose a couple of fan favorites that are always top sellers to add to your queue. Or use your queue to make sure that people see your latest listings or newest projects. The queue is prime real estate, the first thing visitors see after they have looked at your banner. This an introduction to your best products. Give them a lineup of items you’re proud of. An organized shop is one that’s fun to browse. Etsy gives you the options to create “sections” in your store. If you sell knitted baby items you might have a section for baby blankets, booties, clothes, hats, and toys. People come to your shop knowing what they’re looking for. They can quickly enter a section of your shop that lists only what they are interested in buying and save time wading through clutter. Everyone loves a pretty picture. Make your shop beautiful and engaging with gorgeous photos of your products. I admit, this was one of the hardest areas for me to get right, and my photos still aren’t perfect. But my images have improved greatly since I first started selling online. There are lots of articles online that can teach you the basics of lighting, backgrounds, angles, staging, etc. to help you produce enticing photography of your products. Setting up your listings is like filling out a form. One of the first fields you’re asked to fill is a title field. The title of your product offers a great opportunity to improve the searchability of your product. You want to choose a title that aptly describes your product and gives the reader a clear picture of what you’re selling. You also want to give them an idea of how to use the product, who might benefit from it, and any special details that might attract interest. The great thing is that Etsy currently gives you up to 140 characters to construct a title, so you can get pretty detailed. Use a mix of single-word descriptors and long-tailed phrases that your feel are the best hope of attracting people to your listing. The Tag section of your listings is another place to input keywords or phrases that people will type into Etsy’s search field or other search engines that might lead them back to your listings. You are allowed 13 tags per listing. Sit down and brainstorm a couple dozen words and phrases that people might search to find an item like yours. Use the 13 best in your tags. Using a keyword research tool like Google Keyword Planner can help you narrow in on the the best SEO terms. When I buy online, I want to know exactly what I’m getting. What is the size of the product, it’s primary use, the ideal user. What materials is it made from, and how was it constructed? Give the details in an organized, concise way and aim to help the shopper imagine using this product for themselves. Read tons of descriptions and notice how other people sell their products. You’ll learn to identify strengths and weaknesses in descriptions, and yours will improve as you grow your sales skills. Again, utilize keywords and phrases that you think will lead searches back to your shop and listings. Etsy does not tell you how many listings you can or should have. You can list one item or you can list hundreds. However, long-time Etsy sellers report that they noticed a distinct bump in traffic when they reached 50 or more listings in their store. Perhaps when you reach that number of listings, Etsy begins to view you as a serious seller and so they send more traffic your way. If you’re just starting out, the thought of setting up 50 or more listings may seem overwhelming. Not to worry, you can do a few at a time and build up your listing inventory over time. Also, you don’t have to create each listing from scratch. You can duplicate similar listings already in your inventory and just change photos and a few relevant details. This makes the process of getting to 50 much easier. I can make the cost of adding listings more affordable. Use my affiliate link to sign up to become an Etsy seller and get 40 free listings. Maybe you only have 10 items in your craft inventory right now. You’re probably thinking, it will take me months and a lot of money to make 50 of these! Don’t worry. As you make new items, always take pictures of everything you make, even if that item is planned as a gift for a friend and not Etsy. You can list items under a made-to-order label meaning you will only make the item after you have an order and payment for it. This way, you can list pictures of an item that you have made previously and only put together another one if there is a demand. This saves you time and money, as you aren’t making up inventory that is not needed at the moment. Once an item that you have in your physical inventory sells, re-list it as a made-to-order item. While you want to have a nice collection of listings for shoppers to browse, you don’t want to throw anything and everything you’ve ever made into your store. A focused and cohesive store is more organized and pleasant to shop, and the stores with a singular focus do the best on Etsy. So if you make and sell door wreaths, you should only sell door wreaths. Maybe you could branch out just a bit into other door decorations, but don’t go too far from that core concept. Some Etsy sellers have made the mistake of listing every single arts and crafts project they’ve ever made, from crocheting to flower arranging, decoupage and painting, etc. Their store begins to look like a flea market or bazaar … or a bizarre. <Smile> Shoppers don’t know what to make of crazy collections, so they click away. Don’t overwhelm your visitors. Feed them a beautiful, cohesive collection of your creative projects. If you have more than one crafting interest, consider opening a separate store for each. Etsy offers you the option to set up coupons for your store. People love a sale or a bargain, so take advantage of this aspect of human nature. From time to time, put together a coupon code. Publicize your sale on Twitter, Facebook, Instagram, and your mailing list. Ask your friends to share the information. Inform your coworkers and family members. Try to get as many people talking and sharing your coupon as possible. Hopefully, the coupon will drive some traffic and sales to your Etsy store. Through the Etsy App (which is super amazing, by the way. Another article on that coming soon!) you can add shop updates to your Etsy store. You can include a photograph and short description of what’s in the image. This is a great place to feature new listings. You can share about your creative process with “in progress” pictures from your craft room. You can invite them to participate in a sale or use a coupon code. The possibilities are endless. When you post an update, it shows up in the news feed of each person who has liked your shop or favorited an item. Retargeting people who have already expressed an interest in your creative work is genius. Etsy makes it simple, so take advantage of this great feature. Set a schedule and consistently post an update about your shop, listings, and creative pursuits. So there you have it. 15 adjustments you can make to your Etsy shop that will help attract traffic, improve the shoppers experience, and convert visitors to customers. Don’t feel like you have to implement them all in one day. Just set a goal to adjust a couple things a week and you’ll have your shop in top condition in no time. From time to time I get emails or comments from talented crafters that have visited my site or my Facebook page who tell me they are passionate about their creative pursuits and wish they could do something more, as in sell their products and make some income on the side. If this describes you, I have some amazing new for you: There has never been a better time to sell your crafty creations online than right now. I began selling online many, many, many years ago. This was before anyone had heard of Etsy or sites like it. This was before WordPress had developed its incredible interface allowing the average person to set up a full-service website with just a few clicks. I was a web developer back in the day. Using what I knew from setting up sites for businesses and corporations, I hacked together a few pages and a handful of scripts that could take a payment through Paypal, and my career as a craft business owner was born. 1. Incredibly Easy Interface: This pioneer into the sale of handmade goods was making it easier than ever for creative people to market and sell their goods online. Your shop Dashboard is very easy to navigate and most of the functions are self-explanatory. Adding listings is as easy as filling out a form. 2. Affordable: Hosting a website can cost anywhere from $4 – 15 a month for a small site. If you begin to generate a lot of traffic, you may have to pay more for additional bandwidth. In addition, when you run your own site, you eventually have to invest in themes, widgets, and additional services to keep your site up to snuff. All that can add up to a high monthly bill. Some craft seller sites want 15%, 20% or even 30% of your sales as their commission. That’s a big portion of your profits, and you have to raise prices to compensate for the additional expense. With Etsy you get all their services for $0.20 per listing and a small payment processing fee on each purchase. On my listings, most of which are $2.99, Etsy takes around 34¢. That is incredibly affordable! BONUS: If you sign up through my affiliate link, you will receive 40 FREE listings. List your items for free and give Etsy a trial run! What do you have to lose? For the first 40 listings, you won’t pay anything unless you sell. 3. Beautiful Layout: I love the look of my Etsy shop! The layout they’ve designed is clean and engaging. All those wonderful pictures of products just invites you to browse for hours. You would have a hard time creating such a beautiful, inviting layout on a site of your own. 4. User-Friendly: Etsy is also incredibly easy for shoppers to navigate. The Etsy team has done an amazing job making the site simple and fun to use. In addition, because it’s established and reputable, people feel comfortable shopping on Etsy. They know Etsy is legit and secure. Many people won’t purchase from small websites. 5. Taxes Handled For You: Trying to learn, understand, and follow the ever-changing tax laws is a challenge if you are running your own site. If you partner with Etsy, they have a team of people to do all of this for you. Just sit back and let them do the hard work while you collect the profits. 6. Shipping Discounts: Etsy makes shipping easy by helping you calculate shipping costs, providing printable shipping labels for your products, and even offering discounted shipping prices they’ve secured through their substantial buying power. You can benefit from Etsy’s influence. 7. Easier To Generate Traffic: Etsy draws in millions of shoppers a year. There are very few websites that can attract that much traffic. Your listings will be added to Etsy’s search engines, and people who are browsing for items like yours will, hopefully, be presented with pictures and info on your listings. The more eyes on your product, the more potential sales you can earn. 8. The Etsy App: If you are an on-the-go person like I am, you will love the Etsy App. You can run your store, check your stats, send out a store update about a new product or sale, and even sell products from your Etsy App! It is amazing and I use it almost daily. One additional feature to the app that I find incredibly inspiring … when you make a sale, your cell phone makes this “Cha-ching!” sound that puts a smile on your face. Money in the bank! 9. You Need The Creative Outlet: Let’s be real here. You love indulging in your crafty interests. And you can only give your friends and relative so many of your creative projects before that outlet is saturated. Open up the door to millions of shoppers who LOVE handmade goods and creative originals. Etsy is the place. 10. Extra Income Is Always Welcome! I LOVE getting my weekly direct deposit from Etsy. These days, Etsy accounts for more than 50% of my online sales, and that percentage grows monthly. I’m grateful for this platform that allows me to share my creative interests with the world and earn income in the process. So the question is … are you ready to become an Etsy seller? Christmas is just around the corner, the season of giving. During this time of year, I feel acutely aware that I am blessed. I have food on my table, a roof over my head. I have friends and family, a warm bed, and discretionary income to buy what I need. I can’t think of anything I lack, not anything important anyway. My needs — and most of my wants — are met which makes me more sensitive to the fact that not everyone is so fortunate. There are many in the world that lack the basic necessities of life. Even here in the USA, a land of plenty, there are many who do not have warm coats and hats for winter, or blankets for their beds. Others lack the warmth of family and friends, people who add that personal touch to one’s life with their gifts and handmade treasures. Last year the gals in my crochet group decided we wanted to make a difference with our creativity. One of the gals found a shelter that had a need for hats, gloves, and scarves for men, women, and children. We pulled out our yarn stashes and made up sets of crocheted goodies to help those in need ward off the cold temps of northern Indiana and lower Michigan. Lately, I’ve had several people contact me and ask if I want their yarn stash. They were downsizing or clearing out space and wanted to give the yarn to someone who would make use of it. I accepted their yarn supplies with the idea to use them for a good cause. Here are some ways that crafters can use up their yarn stashes and donated supplies while making a difference in people’s lives …. Contact nursing homes in your area and ask if residents would use/appreciate some small lapghans to cover their legs as they ride around in their wheelchairs. There are a lot of elderly people in homes that don’t have family or friends who can visit. These people must feel incredibly lonely during the holiday season. Nursing home staff can distribute your blankets to those who don’t have family visiting over the holidays. A 40 x 48 blanket should be plenty big enough to cover a lap and only takes a few skeins of yarn, or 6 – 8 partial rolls. Here’s one of the lapghans I crocheted for a nursing home this year. I love the colors of autumn leaves. Reach out to the guidance counselor at a local school and ask if there are any kids who need hats, scarves, and mittens. In our area, there are always kids who don’t have them because their family’s finances won’t allow. Call the local homeless shelter and see if they distribute hats, scarves, and mittens to residents. We’ve made oodles of scarves and hats for the shelter in our area! Here’s a picture of the latest delivery my friend Pat made to a local shelter. Is there an organization or church in your area that helps provide Christmas gifts for families in need? Maybe they could use some hats and scarves, or you could donate crocheted amigurumi dolls or crocheted animals for disadvantaged children. Here’s a pattern that my nieces love. Look around you and take notice. Is there someone who might be lonely or simply alone this holiday season? What about the elderly woman at church whose kids live out of state? Or the elderly man that’s always at the diner when you stop by to get take-out. He seems to want to chat, like he doesn’t have too many people to talk to. What about the recently widowed or divorced person who is undoubtedly still dealing with feelings of grief and loss? The holidays can be rough for people in those positions. A handmade gift says, “I care about you,” in a way that a box of chocolates or a store-bought Christmas card never could. It doesn’t have to be big or complicated, just heartfelt. Did you get some ideas? Do you have some other thoughts on how to use your crochet talents to bless someone else this season? Share them in the comments below! I’m always looking for new ways to share my gifts with others. I hope you’ll consider using your creativity and talent to bless someone less fortunate this year. A crocheted blanket will warm the lap and heart of an elderly shut-in. A homemade hat and scarf can lessen the sting of a bitter cold day and make the world seem a kinder place to someone who’s struggling. A child with very few material possessions would love a darling crocheted animal or doll. To you they are just a few leftover yarn supplies and some time. To them, your crocheted gift can ward off desperation and despair, bringing them some much deserved joy and peace this holiday season. Get out there and crochet with a cause! A few months ago, one of my best friends from high school posted a picture of some gorgeous yarn on her Facebook feed. I wrote to ask what she was planning to make. She told me she’d spun the yarn herself and was selling it on Etsy. That led to a conversation about our Etsy stores and our shared passion for the fiber arts. I was thrilled to find she is still my sister at heart in so many ways! Since that day, we’ve spent many hours on the phone talking about our home-based businesses as well as our families, lives, etc. It’s amazing how much we’ve always had in common. There’s a reason we were such great friends in high school! I’m incredibly glad we have reconnected, and I wanted to share her amazing skills and work with you! 1. How long have you been knitting and where did you learn? I am a self taught knitter and have been knitting for 16 years. I learned to crochet from my grandmother when I was 5 years old and never had a desire to learn to knit although my father knit in high school. Once my daughter was born and was about 2 years old, I had a sudden urge to buy mother-daughter matchy matchy sweaters. Well I got online and started searching and discovered rather quickly that the price was pretty substantial for handknit sweaters. I thought “I can do that myself!” So off I went, purchase some yarn and needles, went to socknitters.com for my first go at knitting and the rest was history. My first knit project was a pair of socks! And I’ve never looked back! 2. You mentioned you have an area of specialty in your knitting. Can you tell us more about that? Once I started knitting, I learned that I really had a God given knack for it. I was soon knitting cardigans and anything that I could using two or more colors. Those in the knitting world know this is color work or multiple colors that vary in different rounds as fair isle knitting. Fair isle is my first love and passion. I love creating amazing garments using this technique, which includes steeking! The first time I “cut” my knitting I was terrified! But I soon learned, it was easy peasy. I’ve gone on to teach this technique to some advanced knitters. The technique is quite easy once you get the hang of it, and the combining of beautiful colors is just as exciting. 3. When did you start spinning your own yarn and how did you learn to spin? I began spinning about 3 years after I learned to knit. I soon acquired quite a LARGE stash of commercial yarn. As many of you know, this is not at all hard to imagine. Our love of our crafts, and the ideas in our heads usually prompts us to buy yarn like there is no tomorrow. So after acquiring enough yarn to open my own “mini shop” I thought, “there has got to be a better and cheaper way” to fulfill my love of yarn and save money while I do it. My friend and fiber mentor Charlotte Wolfe of Prairie Winds Farm made that happen for me. We’d known each other for a couple of years by then, and I knew she had sheep and fiber, but had not yet taken her up on her offer to teach me to spin. Well one day I just decided, I’m going to try this out…what do I have to lose? Well, once again, it was meant to be. Charlotte had an old Ashford Traditional wheel, and I mean you had to get a little foot and leg action to get that thing going! But once I got the hang of treadling, drafting etc., it was all she wrote! Charlotte graciously allowed me to take the wheel home to “practice” and next thing I knew, I had handspun yarn galore. That was the start of my next obsession with all things fiber related. I then began collecting as much fiber, of all types, breeds, etc. and spinning as much as possible. It became a bit of a dilemma for me trying to separate and divide my time between knitting and spinning. But as the years have gone past, I’ve married the two along with my other hand crafts like crochet, needle point, embroidery as well as yarn and fiber dying. 4. Tell us a little about your typical spinning project. A typical spinning project for me always starts with fiber! I am a naturalist, so I navigate to wool first. I love all fiber, whether it’s wool (of all breeds), alpaca, silk, llama, bamboo, tencel….the list is endless of fiber out there for spinning. I love blended fibers, and my first love is merino/silk blend! I am a sucker for any colorway that is a merino/silk blend. I generally purchase hand-dyed fiber from some wonderful dyers such as Three Waters Farm, The Wooly Wich, and Classy Squid Fibers just to name a few. I also have quite a little collection of “bare” fiber that I dye myself. A typical project consists of about 4 ounces of a given fiber, my lovely Ashford Joy spinning wheel (which I’ve had now for about 12 years) and a good episode of Ms. Marple Mysteries, or Midsomer Murders and I’m ready to go for a day of spinning the fiber into singles, and if I’m lucky to get through 4 ounces in about 6 hours, I will ply it, or begin plying the same day. Lisa here again … I’m so glad Liz was able to spend some time sharing her amazing talents with us. I hope you enjoyed learning more about her knitting and spinning! As a bonus, Liz is generously offering a free pattern download of her knitted Skater Skully! Want a copy? All you have to do is ask! Send me the FREE Pattern! Follow Liz on Instagram and Pinterest for info on her latest spinning and knitting projects. Protect your dresser top and your jewelry from scratches with one of these easy-to-make Crocheted Jewelry Trays! About a year and a half ago, I graduated to fully adult status and purchased a matching bedroom set. Headboard, bedside tables, dresser, and media cabinet, all in a style and color I LOVE! Yay! It only took my 25 years of adulthood to get the money and a bedroom large enough for a whole set of nice furniture. 🙂 Maybe I’m a late bloomer. Not sure. But anyway, the new furniture brought with it a new set of concerns. I suddenly found myself obsessing about keeping the dresser top scratch free. Since I like to take off my jewelry and set it on the corner of the dresser for quick retrieval the next day, I was concerned that a sharp edge on a ring or the back post of an earring would leave its mark on the dresser top. And remember … I waited 25 years, so I claim the right to a have little OCD in this area. Last week, I got tired of worrying about the problem and decided to solve it. I went to my craft room and dug through my stash and came out with a roll of Lion Brand Wool-Ease Thick & Quick that was begging to be given a purpose. A half hour later, I had a pretty little jewelry tray to keep my rings and dresser top safe from one another. Made with Super Bulky yarn, you can whip one of these up from just a bit of leftover yarn, and it takes less than 20 minutes. Don’t have super bulky yarn sitting around? Use three strands of a worsted weight yarn to get a comparable size. Here’s a quick rundown of the pattern. For a convenient PDF copy of the pattern you can print (PLUS access to all the patterns in my FREE pattern library) click the button below! Pattern instructions are given in U.S. terms. In a magic circle, work 6 sc. Sl st to the first sc to join. Ch 1, work 2 sc in the same st as joining, work 2 sc in each st around then sl st to join. Ch 1, work 2 sc in the same st as joining, work 1 sc in the next st, *work 2 sc in the next st, work 1 sc in the next st* Repeat between ** around then sl st to the first sc to join. Ch 1, work 2 sc in the same st as joining, work 1 sc in each of the next 2 sts, *work 2 sc in the next st, work 1 sc in each of the next 2 sts* Repeat between ** around then sl st into the back loop only of the first sc to join. Working in the Back Loop Only, ch 1, sc in the same st as joining and in each st around then sl st into both loops of the first sc to join. Working in Both Loops, ch 1, sc in the same st as joining and in each st around. Sl to to the first sc to join. There you have it! Easy, pretty, and practical — my favorite kind of pattern! Want to save this pattern idea? Grab the download and you’ll always have it on file. I recently filmed a video on how to crochet a store-bought purse handle right into your crocheted purse as you are crocheting. (View it here.) You can also crochet metal rings into the purse and attach handles that you’ve crocheted for a perfect match to your work. 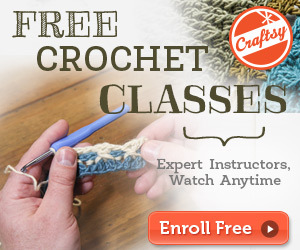 But how do you make crocheted handles? The gals over at Knitting Daily demonstrate a neat crocheting technique that results in a spiral handle that looks like it would be really comfortable looped over your shoulder or arm. I’m going to use this technique the next time I need to crochet purse handles. Check out this short video demonstration! Are you ready to try to tackle a project like this?